The Paisley Long Shawl was inspired by the designs of the beautiful woven paisley shawls of the 19th century. 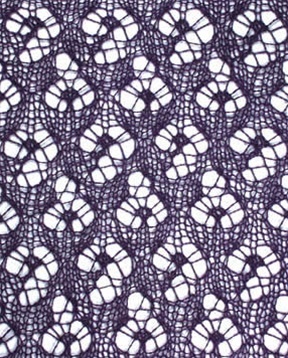 It is an interpretation in lace of a long shawl dating from abount 1820, and features original lace motifs of botehs (the small motifs filling the middle ground of the shawl) and larger paisley patterns. Recommended for experienced knitters. Finished size is approximately 29" wide and 77" long, not including optional fringe. Full size with fringe takes about 1400 yards of lace weight yarn.